Does anyone know about this piece of ground support equipment used with the Blackbirds? A model number, drawings, its function, and any other information would be greatly appreciated. I've been told it's an "air/water separator," which makes sense as all the pictures I have seen show it operating in damp or humid weather. Air from an air conditioning cart or hangar installation entered the tapered end via a large hose and exited out the other end through a smaller hose that connected to the air receptacle in the SR-71 nose gear well. 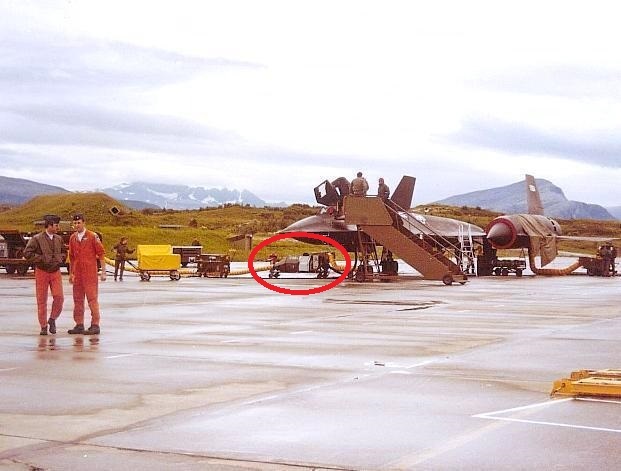 Here it is being used to prepare the jet to leave Bodø, Norway after an emergency landing. The A/C cooled the cockpit and avionics bays. This photo shows the A/C cart feeding the unit, which is partially out of the frame at right. I would like to scratch build a unit for a diorama, but I cannot find any information beyond what I have stated here. An equipment designator, dimensions, drawings and/or more photos would be welcome. I have collected every photo and video screen capture I could find, which aren't much, but I did find the end of the Internet in the process. I also tried to contact the Air Force Historical Research Agency online, but the form failed to transmit. Then I tried doing the same with the Beale AFB Public Affairs office, with the same results. I was able to find an email address and send a message, but I doubt they will reply. Any Habus out there who can help? "You can't have everything--where would you put it?" I found the first picture on the "blackbird website, labeled as an "air conditioner unit". 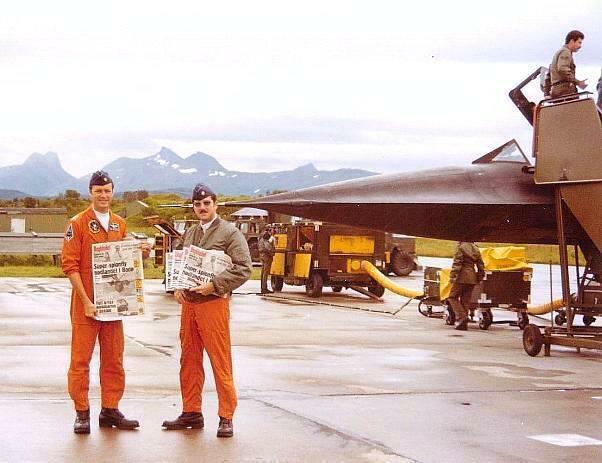 Here is where I found the picture ( https://www.sr-71.org/photogallery/blackbird/miscellaneous/index.php?show=all). Not sure if this helps. I was an AGE mechanic in the AF and that is not a piece I am familiar with. I can see that it is using bleed air from the -60 and then has a heater/AC duct coming out of it to the AC. It may indeed be a piece of AC equipment specific to that bird. Since that plane flew so high it may be a special unit of super cold air to help simulate altitude for avionics. It looks a bit ramshackle and rough. I'm curious if it was a one off unit? Edit, if you look at the second pic you can see a heater attached on the left engine also. Very curious indeed. That's where I originally found it, too. I contact the owner of the Website, who was unable to provide any more information, except that the picture was taken at the March AFB Museum. I'll contact them next. "I was an AGE mechanic in the AF and that is not a piece I am familiar with. I can see that it is using bleed air from the -60 and then has a heater/AC duct coming out of it to the AC. It may indeed be a piece of AC equipment specific to that bird. Since that plane flew so high it may be a special unit of super cold air to help simulate altitude for avionics. It looks a bit ramshackle and rough. I'm curious if it was a one off unit? Edit, if you look at the second pic you can see a heater attached on the left engine also. Very curious indeed." The AC was for cooling the avionics bays and cockpit before launch. I'm told the unit in question is an "air/water separator" and it makes sense that in damp environments they would not want to pump moist air into the equipment. There were heaters hooked up to both engine nacelles, too, unrelated to the avionics bay & cockpit AC. At lower ambient ground temperatures the lubricants in the J58s had the consistancy of peanut butter. The engines had to be pre-heated to 160° in order to thin the lubricants sufficiently for the turbine to turn for startup. There were probably a handful of these units, and likely not very many. I have seen pictures of them in use at Bodø, above, (flown in from Beale AFB), Okinawa, Mildenhall in the UK and at Beale. There are several different sources of information available. You can buy a 1989 flight manual for $99.99. A Wings/Airpower magazine collection with 3 flight manuals for $29.95, a Haynes Owner's manual, a Squadron In Action book, or a Squadron Walkaround book. You might try sending a snail mail request for info to the AF History Agency, the USAF Museum, the Edwards AFB Public Affairs office, the Edwards AFB Museum, and NASA. I can see all this being correct. The bleed air that was produced by the -60 is quite hot. Normally the bleed air is only used for start up. I can totally see the 71 having some special equipment just for it due to its unique mission.